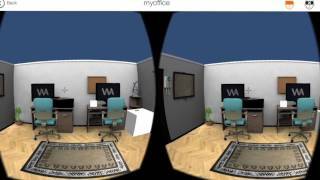 Turn your Autodesk® 3ds Max® designs into Augmented & Virtual Reality with just one click. 2. 'Create AR/VR' pop-up screen will appear. Choose Augmented Reality or Virtual Reality and press 'Create'. 3. update your e-mail (only for the 1st time) and Project name. by clicking 'OK' - the process will be done in the background. 4. once finalizing the process, You will receive a thank you Pop-up confirming that 'your project has been created successfully' and check e-mail for further instructions. 5. You will receive an email asking you to confirm your username and you will receive an initial password. For an AR project, you will receive an image target, which you will need to scan for each time to experience the AR content. ENTiTi Creator tool (WakingApp cloud-based platform). You can add Audio, Video, Animations and more interactive commands to enrich your design and automatically share the file on any AR/VR devices including HTC Vive, Oculus Rift, and Samsung Gear VR etc. I have been done all process but not receiving any mail Please solve it. Does it work on 3ds MAX 2019? What a great way to share my models in an attractive way with others. I can watch any model in AR and VR in minutes!